JERUSALEM – A renowned Israeli archaeologist has announced the discovery of an earthenware jug from the Davidic era that features the oldest alphabetical text ever unearthed in Jerusalem. A 2006 article about Mazar’s archaeological work published in Moment Magazine describes how she likes to keep a laptop, various papers, and a “heavily marked Bible” on her desk. Once again, Mazar’s archaeological strategies have paid off, as she recently announced the discovery of several ceramic jar pieces which were most likely created during the time of Solomon in the 10th century B.C. One of the fragments features writing engraved on its side, making it the oldest alphabetic text ever found in the Jerusalem area. 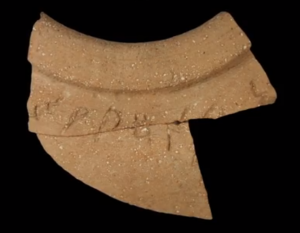 According to experts, the letters on the jar fragment are not Hebrew, but rather an early form of Canaanite writing, perhaps written by a member of a neighboring tribe. While the exact meaning of the inscriptions remain a mystery, some have speculated that they might be communicating either the name of the pot’s owner or the contents of the jar. All these jar pieces were discovered in an excavation site located in a national park near Jerusalem’s Temple Mount. Mazar is the head archaeologist of the project, but the East Jerusalem Development Company, the Israel Antiquities Authority, and the Israel Nature and Parks Authority were all involved with the excavation, according to Live Science. Although some questions remain unanswered, Mazar says that she is thrilled with the discovery. In a 7-minute video detailing her find, Mazar once again gives credit to the Bible’s reliability.